Way back when, I mentioned I was helping a good friend (and fellow Villanova graduate :)) with her dining room. It still isn't complete, but she's made progress. 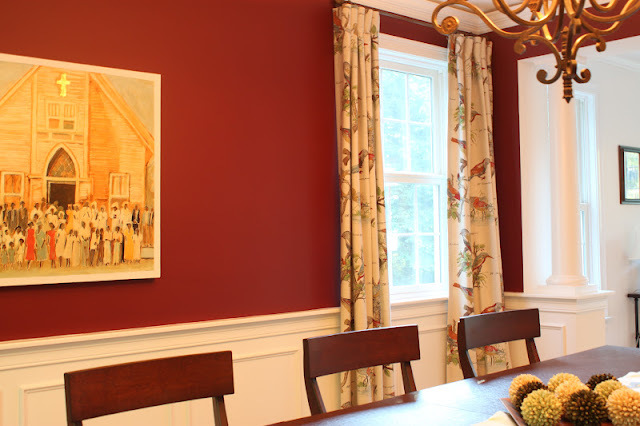 When we started discussing options, the room was empty except for the current paint color on the walls and the chandelier. 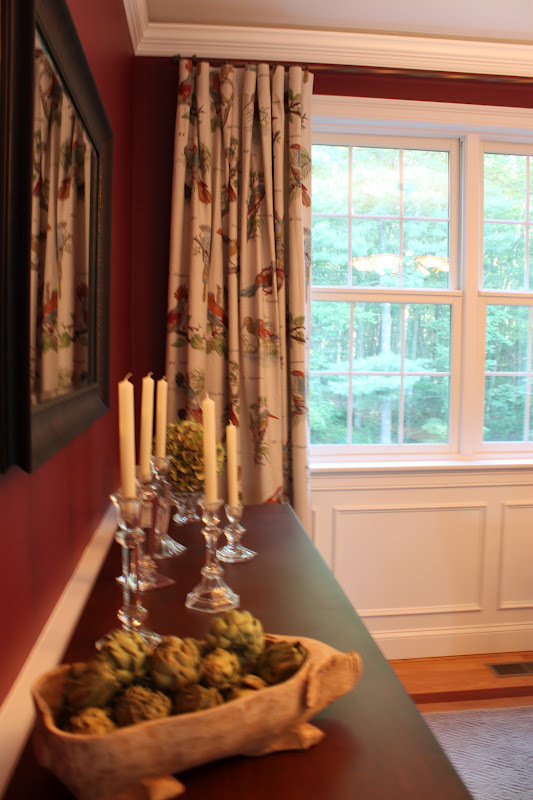 She wanted to invest in furniture, a rug and much needed window treatments. And she wanted to leave the wall color and chandelier in tact. When we were discussing dining room tables, she knew she wanted a turned leg table; something similar to a farm table look, but less rustic. You might remember the inspiration post here? 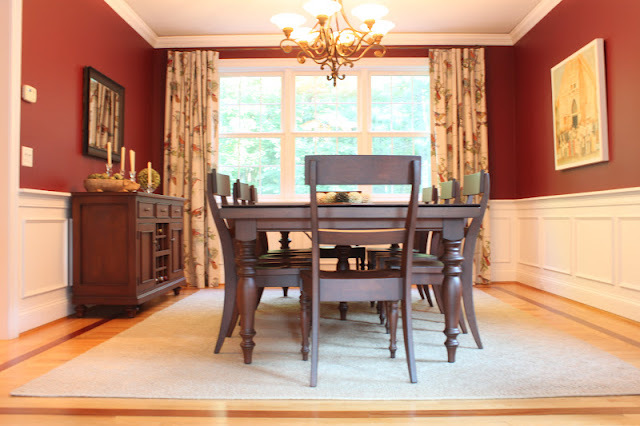 She narrowed down her choices and ended up picking a classic turned leg table with a beautiful set of chairs and sideboard. For the windows, I suggested paneled drapes using the allora fabric from calico corners. I liked how it has a neutral background, but incorporates the red to tie in her walls and the aqua blues to tie in her artwork. Since we already had a significant amount of color from the walls, we decided on a neutral rug. She wanted it to be practical and affordable, because with two children under the age of six, a dog and a cat, accidents were bound to happen! 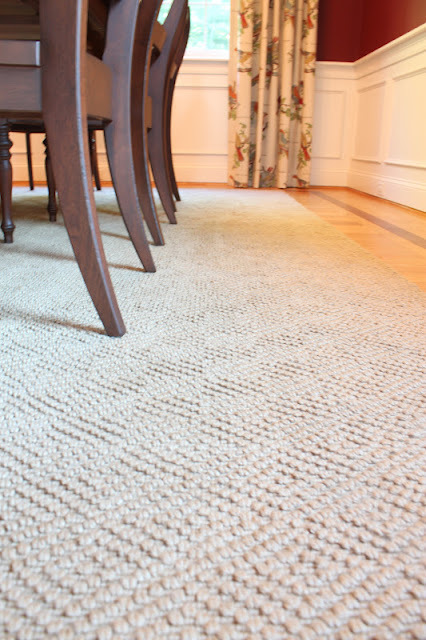 So, I suggested the jewel jute diamond patterned rug, mentioned here. She really has done a great job putting this all together and it shows. 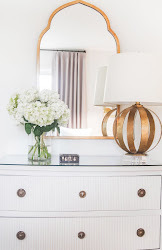 I love how she styled her sideboard too! This is still a work in progress and next up she hopes to replace the mirror with a larger one, add some parsons head chairs to soften the wood tones (I really want her to do the parsons chairs in a pale blue buffalo check!) and perhaps a new chandelier. And, next Monday, we will be trying paint colors for her living room! Fun, fun, fun! Nova!! So great that you can help a friend out and collaborate so well. I love the fabric for the drapes - I think that ties everything in so well and frames/softens the room really nicely. Nice work! And looking forward to seeing what's happening in the living room too. I'd love to know down the line how she likes that rug - that's really nice. I always like to check in with people to see if they're still loving a rug after a while. I ended up spending more than I wanted on a rug from Crate & Barrel but I've been really happy with it and surprisingly for how light it is it hides dirt nicely. It looks great! Love the rug and it looks durable. 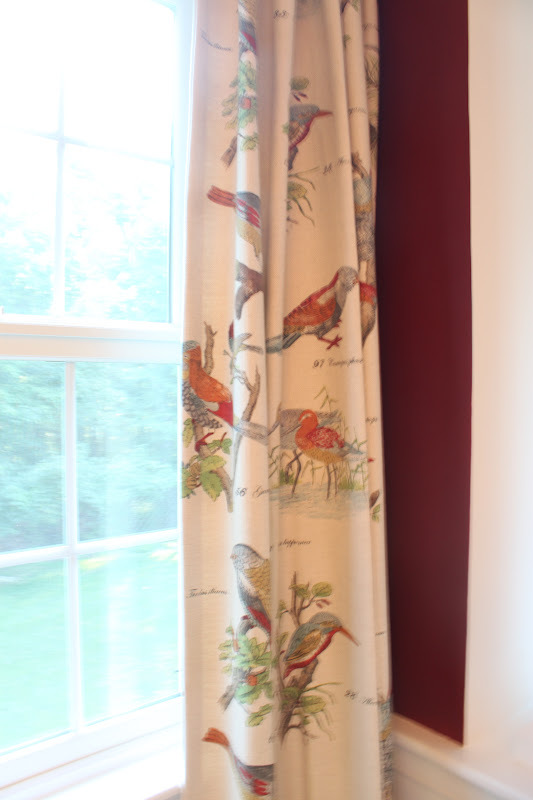 The fabric in the drapes also looks great against the paint in her room, too! Way to go! It looks lovely. The fabric choice for the curtains is perfect as it adds just the right amount of color and pattern. Looks beautiful. Where is the table from? I love the fabric of the drapes! Great choice.